' Toddler Activities Part 2: Perfect for Traveling or Quiet Time - Sisters, What! This post may contain affiliate links (all opinions are 100% mine, other wise I wouldn't share them). As promised, here is part 2 of my Toddler Activities post. As I mentioned in the last post, we were going on 12 hour drive to California and needed lots of good hands on activities for a 2 year old that didn't take up much space. At first I thought I was packing to many bulky items, but then I figured out a way that some items could cross over with the different activities. 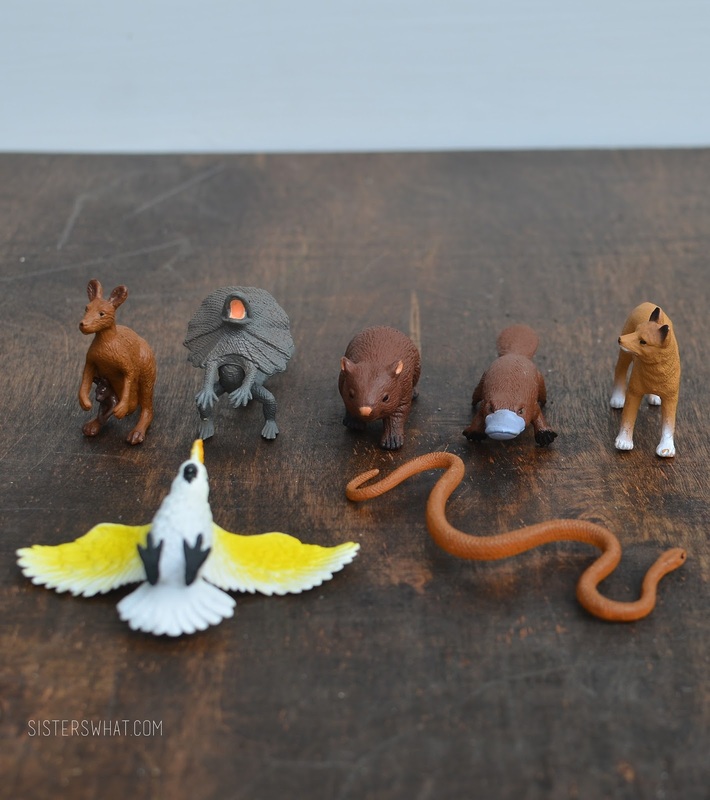 Like these fun little animals here. Have you ever heard of Safari Ltd TOOBS ? We love everything they have. Both my boys are obsessed with all the little animals that we have. We been slowly collecting Safari TOOBs and this Safari Ltd Land Down Under TOOB was a new acquisition for the trip as a special treat for the boys. There is just something magical about little animals like these. They play with everywhere; in the bath, on the table, with their trains, etc. I love that each animal brings up questions from my 4 year old which leads to us getting many books from the library about the current animal in question. A fun thing about them being small is that they can fit through the lid of an empty wipes container. 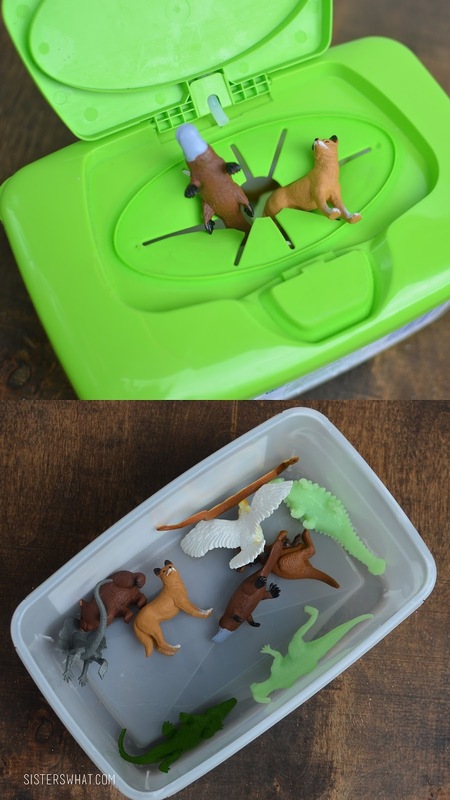 Both boys love taking each animal in and out through the hole top hole. We like to play the guessing game, puts his hand inside and guess what animal he is holding and pulls it out to see what it is. He then asks where the animals lives. 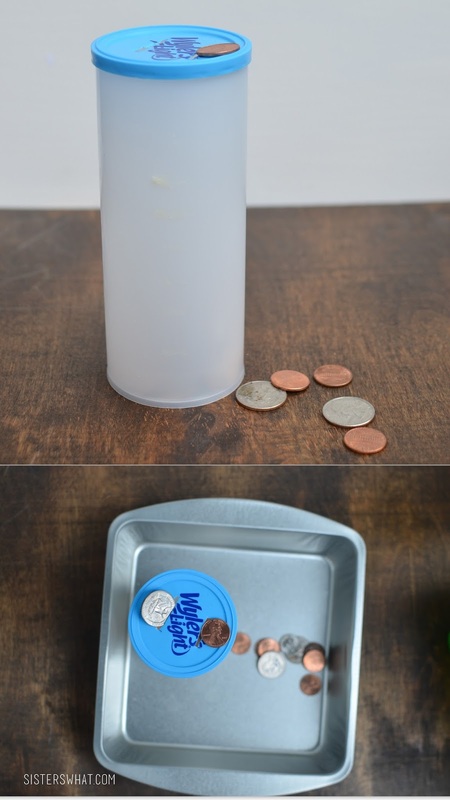 I got this idea when my 2 year old kept still his older brothers coin bank. He would have us open it and empty it out and then he loved putting each coin through the slot. I happen to have this empty lemonade container and cut two holes in the top. He was so excited in the car when I pulled it out to show him. The last activity I brought for Sweet Cheeks was magnets. Again, I he was able to use the same square pan (dollar store) that he had been using to help contain the money and also the fluff balls. There is just something fun about magnets. However, I think having a little container to take the magnets in and out of was probably just as fun as actually placing the magnets on the squares. 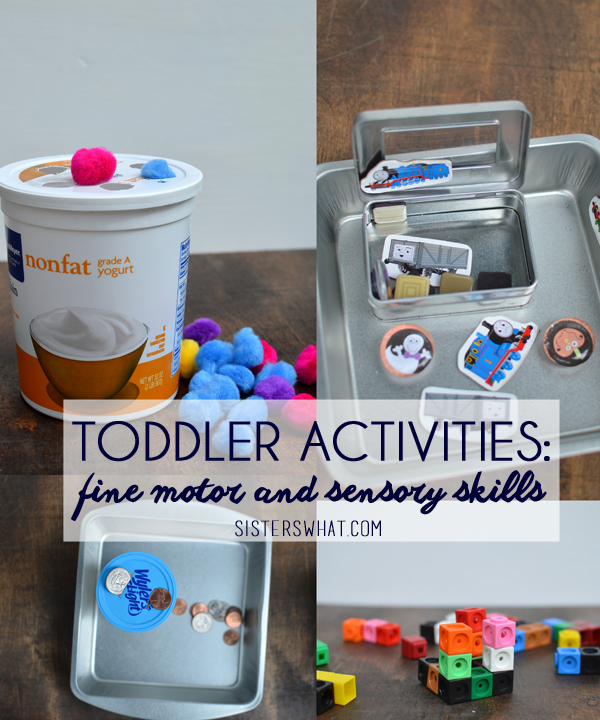 And there you have it, fun activities that help with fine motor and sensory skills to entertain the littles during a long road trip or even during quiet time. Stay tuned for my next post about activities for older preschool age children. Make sure you check out Part 1 of Toddler Activities if you happen to miss it.